Jump, grasp the bar with an overhand grip (i.e. thumbs facing one another), slowly lower yourself to a dead hang (without allowing your legs to swing behind you), and bend at the knees so that your lower leg forms a 90 degree angle with your upper leg. If jumping is not possible, find an adequate step/stool so that you can reach the bar. 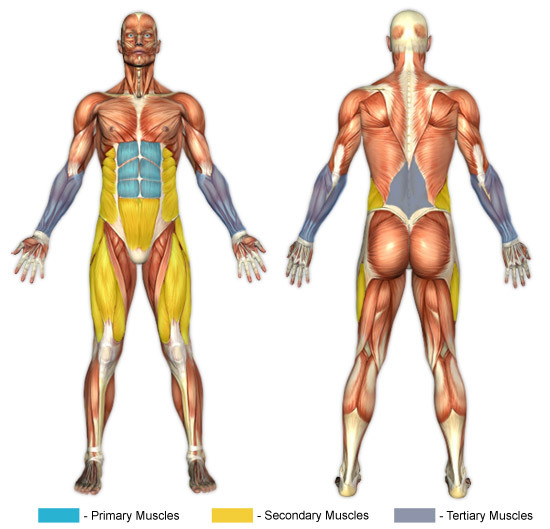 Slowly bring your knees to your sternum (chest), rounding your back--by rotating the pubis--as you do so as you achieve optimal upper abdominal recruitment, and exhale throughout the movement. Once full abdominal contraction is achieved, hold this position briefly (about 1-2 seconds per repetition). Note: It's okay if you cannot bring your knees all the way to your sternum; just do the best you can. Slowly bring your knees back down to the starting position, inhaling throughout the movement. To place focus on the abdominal core simply flutter your knees up and down, being sure to keep them above horizontal. Do not allow your legs to move too far behind your body because this increases the chances of swinging, as well as vertebral compression (i.e. pinching your lower back).